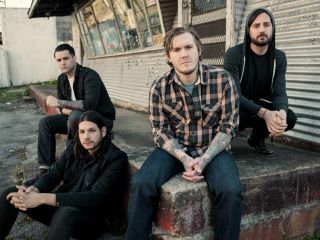 Brian Fallon: "He's one of the coolest people I know"
The Gaslight Anthem's frontman Brian Fallon and guitarist Alex Rosamilia have told us about the huge positive influence Pearl Jam, Springsteen and Rage Against The Machine über-producer Brendan O'Brien had on their fourth album Handwritten - released today. "Half the reason I play guitar is the records he produced," admits Alex. "A lot of the records he did in the '90s. To have him working on our songs… it was almost overwhelming for me. Surreal. I almost had to wait until I was back home to think, that just happened didn't it?" "I didn't know what to expect," adds Brian on their first meeting with O'Brien. "Everybody told me he was mean - including him! 'I'll just tell you exactly how it is and I'm not worried what you think about that, I'm just gonna tell you,' he said. But he's not really like that. "He's super, super nice. But he's also super pumped - he's not jaded at all. That's the really great thing about Brendan - he's just so excited to play music and listen to music. He's got so many good ideas too. He's one of the coolest people I know." For more on the making of Handwritten and a full Gaslight Anthem rig tour, see Total Guitar issue 230, on sale now. Buy the Total Guitar digital edition from Apple Newsstand.